Don Baker (Edward Albert) is a blind young man from a wealthy family who wants to prove to his overprotective mother (Eileen Heckart) he can make it on his own. So he moves into a low rent apartment in the city. His new neighbor is a free spirited young woman named Jill Tanner (Goldie Hawn) who takes a liking to him and inroduces him to new experiences. Completely oblivious to us since we watch a trillion movies, I had added this to our Netflix DVD queue because my mom recommended it to us a while back. We had put it somewhere in the middle of our DVD queue to maintain fairness amongst our other listees. This 1972 feature is one we had not knew about outside the brief synopsis on IMDB, as well as the name of its leading lady: a young Goldie Hawn. When we first got this movie in the mail, we didn't watch it for at least 2 months as it sat on our top of our DVR collecting dust. There were other things, you know? Well, we finally got a chance to watch it one overcast afternoon and cannot recommend it enough. This is a charmingly funny film that has a lot of great whit and a strong heart to it. It's actually based on a Broadway play of the same name, which is also something we didn't know. Starring alongside Goldie Hawn is Edward Albert, who plays Don Baker, a young blind man who wants to prove he can make it on his own without the help of his controlling mother. He is well read, very intelligent, and quite a talented musician despite his disability. Albert does a great job in his role and we, the audience, fully believe that Don is actually blind, even though Albert himself is not. Goldie Hawn plays Don's free spirited yet kind of ditsy neighbor Jill, who actually takes quite a while to realize Don is blind when they first meet. This provides a great exchange between the two with quite a few funny moments throughout. And trust us when we say, if you don't know the premise of the film and had never heard anything about it, you wouldn't have known Don was blind, either! Jill finds herself very impressed with Don's capabilities despite his blindness and is quickly infatuated with him. Her infatuation and her physical expression of that leads Don to have deeper feelings for her, even though the time span of their meeting only stretches about two-ish days (if that!). Eileen Eckert plays Don's mother, Mrs. Baker, and does so brilliantly. She is overprotective of her son, as well as controlling and manipulative, but despite all of this, she is also very likable as she is always quick with a witty quip. You can tell she really does love her son, even if the way she shows her love is a bit toxic. This was no role she was a stranger to as she played Mrs. Baker in the stage production, which earned a 1970 Tony nomination for the part. This time around, Eileen's performance actually earned her a much deserved Academy Award for best supporting actress as she delivered a deep, truly layered performance. 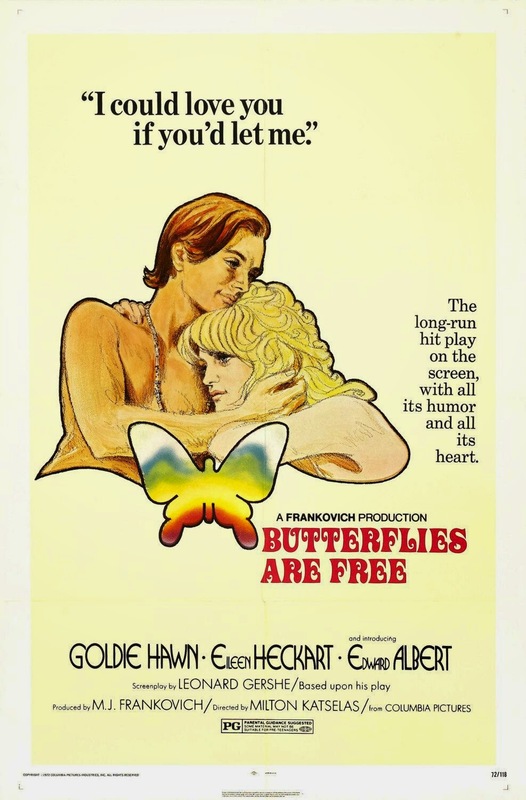 "Butterflies Are Free" is a wonderful mix of comedy, drama, some music, love, capability, and heart. We urge those who enjoy movies from any decade to see this film!! Do we recommend this movie: ABSOLUTELY YES!!! One year ago, we were watching: "Jersey Boys"